The South Whiteshell Trail is a gorgeous hiking trail that winds through the beautiful forest terrain of the Whiteshell from Rennie to the Ontario border. The trail is divided into several different portions that stretch across the South Whiteshell; so whether you’re feeling ambitious and want to bike across the south Whiteshell or just want to take a casual stroll near your campsite, this trail is a perfect way to explore the gorgeous landscape and nature of the Canadian Shield. On August 31, the South Whiteshell Trail Association will be hosting a grand opening of the newest section of the trail that spans from the southwest corner of Falcon Lake to the Ontario border. This portion of the trail winds through beautiful forest ecosystems just south of cottage development on the south shore of Falcon Lake. This section starts near the boat launch and picnic area (by the causeway) at the southwest corner of Falcon Lake and extends east, past Falcon Lake to the shores of beautiful and secluded High Lake. There are several connector-trails along the South Shore Road (Ridge Road) to make easy access for cottagers along the shore. The grand opening will take place at 2:00 pm on Sunday, August 31 and will be a great outdoors event for everyone – young and old, cyclists and hikers. The event will start at the causeway, just past the Falcon Lake Marina on south shore road. After cycling or hiking the new portion of the trail, participants will gather at the Falcon Trails Resort for food, live entertainment from local musicians, and a beer garden. 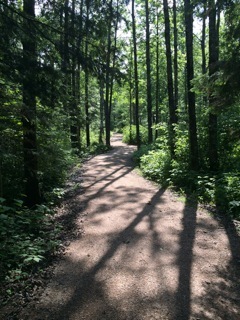 You may also want to check out other portions of the trail that take you through right across the south end of the park, including the Centennial portion, which runs for approximately 25 km from the Bear Lake trailhead to Caddy Lake. The next portion runs for about 14 km from Caddy Lake to West Hawk Lake, with a portion diverting from West Hawk to Falcon Lake. There is another 14 km of beautiful marsh trail that crosses to the south shore of Falcon Lake, where the newest section begins. The trails varies in levels of difficulty. For more information on the event or general information about the South Whiteshell Trail, send an e-mail to swtainfo@gmail.com. This entry was tagged Bear Lake, Biking, Caddy Lake, experience the whiteshell, Exploring, Falcon Lake, Falcon Lake Marina, Falcon Trails Resort, Faloma Beach Marina, hiking, Home 204 Kitchen, lake living, Mountain Bike, Running, South Whiteshell Trail, West Hawk Lake, whiteshell provincial park. Bookmark the permalink.